This review first appeared in the May/June 1988 edition of Living Blues magazine. Joe Louis WAlker's definition of the blues seems to be more of emotion than of form. Walker's second album, "The Gift," is full of his swinging, funky blues-soul hybrid. He is a stupendous composer, with tunes like "One Time Around," "Everybody's Had the Blues" and "Main Goal" showcasing this talent. He also co-wrote "Thin Line," "What About You," "1/4 to 3" and "Mama Didn't Raise No Fool." Walker has the ability to balance the horn section with his own guitar leads, while folding both into the background to make room for his vocals. The compositions never seem hurried, and everything falls into place just as it seems it should. His playing is likewise excellent. Walker has learned the toughest lesson for a young musician  that touch is as important as speed. You'd better find it before it finds you. Walker punctuates his dialogue with sage guitar passages, while Kelvin Dixon (drums) and Henry Oden (bass) anchor a tight rhythm section, and Jimi Stewart provides sharp keyboard work. Steve Berlin, of the Los Angeles bands Los Lobos and The Blasters, makes a guest appearance with his tenor sax on "Mama Didn't Raise No Fool." 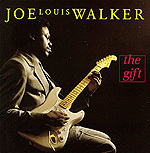 This second release from Joe Louis Walker shows him as a young musician continuing on a path of phenomenal artistic growth.